This P-Spot Massager Is A Medically Researched And Designed Device That Works In Harmony With Your Body'S Own Movements. 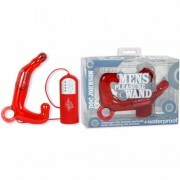 It Stimulates Both The Prostate And The Perineum In A Rhythmic Motion That Builds Up To Unprecedented Male Orgasms. The Massager Is Easy To Use And Fulfilling For Both The Beginner And The Expert, With Progressively Rewarding Exercises And Experiences. Use With Lubricant When Desired."